Quietly despairing your lot in life? Interested in high-end Japanese watches but you can't afford one? Seiko's got you covered with the SARB line. The corners may have been cut, but you can still pretend with the SARB033. Seiko's SARB033 is an "automatic" sport wrist-watch that hits a nice note of legibility, form, weight, and accuracy. I'm by no means a watch expertnote 1, but I think I've got this one figured out. reverse-mounted lens for very shallow depth of field. The materials and construction are what you'd expect from a Seiko watch in the hundreds of dollars. After three years of regular wear, the sapphire crystal has yet to have a single blemish. The steel case, while slightly burnished in a couple of places, otherwise looks great and needs only some occasional gentle cleaning. I fell in love with this watch online, as it's not available in stores in North America. My wife picked up my copy while on a trip to her native Japan for my 43rd birthday — a great way of saving some money while retaining Seiko's global warranty. The drawbacks from this however were: I hadn't realized how small the date window is; and the bracelet isn't as substantial or attractive "in the steel"; and the sapphire lacks an anti-reflective glare. The former became a problem for me about two years into my ownership of the watch. The lenses in my eyes began to ossify (along with my political opinions) and I began to find it hard to see the window date. It's now impossible without reading glasses. That's not the case for similar watches I've looked at, and it's not a problem with my inexpensive diver. The window date on the SARB033 is small, crowded with an unnecessary steel trim and recessed deep into the dial. As for the bracelet, I've encountered two issues. First, I've never found a comfortable fit. The thing allows only one small adjustment, and neither of the immediately adjacent offerings worked for me. Secondly, I've found that the weight of the case and its contents tends to pull the watch around my wrist, especially in the winter (our bodies are more slender in the winter for some reason). I have to assume that some of the links are folded rather than solid, perhaps as a cost-cutting mechanism. Aesthetically, the bracelet doesn't match the case. The links have none of the design elements from the case and dial. I first replaced my bracelet with a black "crocodile" patterned leather strap. Black and silver work very well IMHO. As the photo above ably demonstrates, there's a good deal of glare on this watch. In possibly another cost-cutting effort, the sapphire seems to lack an anti-reflective treatment. Even my $50 "beater" watch—a Casio MDV-106—has a crystal with a much more limpid look. The obligatory on-wrist shot. My wrist is 7⅞" or 200mm around. But, you get what you pay for, and the band and anti-glare "issues" I'm citing are likely purposeful to distinguish the SARB033 from watches like SDGM003 or SARX035, which cost twice as much (or more). At $600-$900, I wouldn't have bought either, so I'll live with the glare. Size:I find that today's 40mm++ watches remind me of Flavor Flav: self-consciously absurd. Men's dress watches were never HUGE like they are today, and I'm a fan of the old ways. I've got nearly 20cm wrists — about 7 7/8". On me, the 38mm SARB case suits the width of my wrists and lets me wear the watch under the cuffs of my office shirts. That 11mm height becomes a problem with some of my dandy French cuffs unfortunately, but as I've been trying to convince my wife, that's why we have slim dress watches. Design: This watch has a strong Japanese vibe, which is why I don't think it was released internationally. It blends a conservative middle-management utilitarianism and "price point" while striking the quiet sophistication that 95% of Japanese adults seem to understand is their duty. But if you peruse the Seiko line-up you'll note very similar designs way up in the stratosphere, among the Grand Seikos. note 3 I therefor suspect that the '33 is a designed for the Japanese domestic market to fill an aspirant's niche — e.g. if you're that Japanese middle-management type you're likely well aware of the Grand Seikos and this is your "me too". That's pure speculation, but I like the looks of the thing regardless. Rather than to go into great detail, some photos should suffice: it's a three hand watch with a date window and a black dial, "Dauphin" hands, a beveled chapter ring, a sapphire crystal, and a stainless steel case and bracelet. Thanks to that clever 6R15 movement, the case stands at a middling height on the wrist at 11mm. The case avoids falling into any particular time period with a one-tone stainless steel construction, a minimal bezel, sleek raised matte portions that swerve around the bezel and lie out the length of the lugs. On the dial, everything matches the stainless case in color and the hour markers have linear incisions that match the incisions on the case. Back to Japan: I'm convinced that this watch and its various siblings are a steady sellers in their home country. From my five years in middle management in that country, I'm sure that this watch meets the cost-conscious and understated taste that sells to the Japanese salaryman (or rather, the wives that hold the purse-strings). This is a land of consensus, and not one of ostentatious displays of status. A domestic model such as this, with its office-friendly looks and reasonable price, is exactly what would appeal. Of course, there's an attitude of quiet desperation about the middle rungs of the corporate world, and I'm still sadly toodling along in the thick of it at 46. Hell, I probably will be for life. And so, my SARB033 with its smart refinement and its cut corners will be there with me, timeless and enduring, telling me the time and pleasing me with its subtle good looks. I bought a beater Casio that turned out to be a fine watch –with a few warts. That is a great review. I got my sarb033 a week ago. Absolutely love everything about it. I have 19,5 cm wrists as well, so at first I was unsure if the sarb is a bit small for me (I am an electrician and in my line of work g-shocks are pretty much the only option, so I am used to wearing big watches). Sarb is going to be my "nice" or "dress" watch. Glad I read your review, it made me feel like I made the right choice after all. Thanks for your comments, Oleg. I'm glad you enjoyed the review, and that it resonated. Enjoy the watch, it's been 4.5 years for me and I'm still in love. The SARB033/35 have the most legible date window I've seen on any watch. It's quite large considering the proportions of the watch and the dial size. I don't find it recessed into the dial at all. I've compared it to larger dial watches and the date window on my sarb is larger and more legible. To each his own I guess. Which watch that you have or seen has more legible date window? Since I replaced the metal bracelet with a decent leather strap, I've been happier than ever. I see what you mean about the Rolex Oyster Perpetual - I had to wonder if that wasn't a design reference for the SARB. Thanks for the nice writeup of the SARB033. My first decent watch was a 6309. I fell in love with Seiko watches when this watch lasted through 42 years of college, work, and into retirement. It has been a workhorse and only one cleaning and crystal replacement in all that time. I always wanted to get another Seiko that was a little more upscale.and after a half year of study I just now ordered a SARB033 and am waiting for it to arrive from Hong Kong. Looking forward to this beautiful watch and hopefully along with my other watch it will outlast me. In our throwaway world today it is rare to find a watch you are not supposed to toss after a few years, one that lasts without problems and is built with craftsmanship and pride. Thanks again for your article. Thanks for sharing your story, Ken. The 6309 is a great-looking watch. Good luck with the new SARB, and welcome to the club! Hey, you came back. Sorry I couldn't help with a link. During the "summer water retention" months I go back to my bracelet. But I can tell from the recent flopping of my watch it's time to go back to the leather. Just FYI - the bracelet links are solid, not folded. Can you provide a link as to where you got the croc style leather strap from? No link, I'm afraid, I bought it in a local jewelry shop. Which I suppose you won't find out, because you didn't provide your email address. I have read your great review on Seiko Sarb,although not despairing my lot.I am beyond that phase. I happen to be a watch collecting idiot. I have 3-4 Seikos,but the vintage ones. They are my favourite watches.Especially an ancient KingSeiko with the goldish coin on its back.A true classic,although the design has been stolen from Rolex Oysters without a second thought. I don't mind. I love your attitude to watches and watches as denominators of status in society.I completely share your being "ossified" re size. I might even be more ossified than you since I prefer square or rectangular watches .I am an old guy,65, seldom getting surprised. Your wise and peaceful review was a very pleasant surprise,though. God bless you,and your wife. Thanks for your kind comments, George. I quite enjoy my watch, it's the finest I've owned. The King Seiko is a beauty, isn't it. 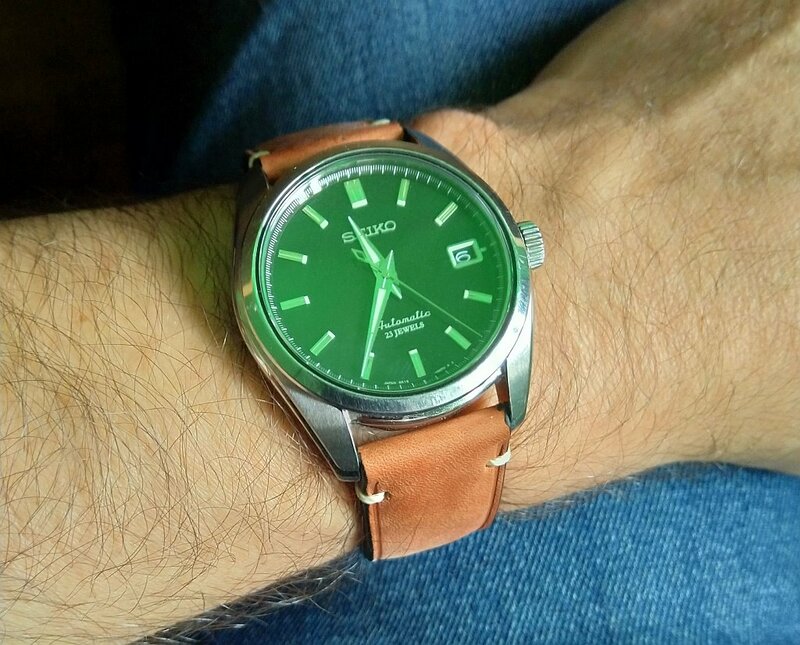 A friend of mine in Japan was about to buy his first Grand Seiko when we last spoke, I should see how he's doing. Blessing on you and yours as well, sir. Thanks, Ron! It's easily the best watch I've ever owned. This watch only leaves my wrist if I'm fishing or doing something else that will likely get it dinged up. A very nicely written review, of a very decent watch.